If you have read my last few posts, then you should know I am trying to make my desktop look dark. I feel darkness somehow could look great if everything is set up well. My Window Manager is Fluxbox, it took me few hours to adjust Fluxbox, Most of programs I use are GTK+, so I installed a dark theme Clearlooks ZenBurn for GTK+. But there is a problem for those programs, the icon theme. They usually have high contrast in dark background, but I didnt try to install a new one, or say I couldnt find a good one. However, thats still fine to me with many of them. As for QT apps, I decided not to touch them. OpenOffice is the worst one under the dark theme, you could see by yourself. Firefox is okay, by the way, I also made a Vimperator colorscheme for it. 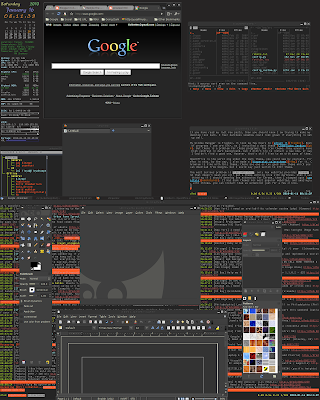 Chromium is fine with this theme, there are one or two good dark theme which you can download from Google, but I would say just switch to GTK+ theme. The most serious problem is the websites, only few websites provides theme and that doesnt mean you will get a theme working nice with darkness. I was thinking if I should develop one extension for Chrome, which can automatically adjust the colors, then I stumbled upon userstyles.org. It has dark themes for most popular websites, and amazingly, with Chrome, you can install them as extension just for a few clicks. But they dont always work if the websites get updated. As for terminal apps, that would be much better since they usually only use 16 colors and that you have full control of those colors. You can simply reduce the saturation or lightness of the colors, so to low the contrast. One app I know is using theme is Midnight Commander. I dont have desktop image but pure plain color. The only thing I have on desktop is Conky. I changed the colors but it definitely wouldnt fit your taste.